Some of my favorite moments in baseball are provided by players who, for one reason or another, absolutely should not have done what they just did. Ben Revere hitting a dinger. Vlad Guerrero swinging in the middle of an intentional walk. Willie Mayes Hayes sliding short of the bag. Those moments are magical and hilarious. And perhaps less amusing but more exciting, there are guys who don’t give a flip if they’re behind in the count and don’t have any leverage. They’re still reaching base at a strong clip, providing small thrill by getting there when it looks like they’re all but back in the dugout. Below are the guys who did it most in 2016, with data courtesy of Statcast. For the record, that’s the top 10 from last year, plus their last two years before that for some context. “Times reached” refers to hits and walks, as those are things over which they exhibit some control. It’s a fun group because it gathers players you might not always talk about in the same conversation. They play different positions, hit at different spots in the order, and are at different points of their careers. But they were all able to foil opposing pitchers last year when their backs were against the wall. We can get some idea how they operated when behind or not, too. 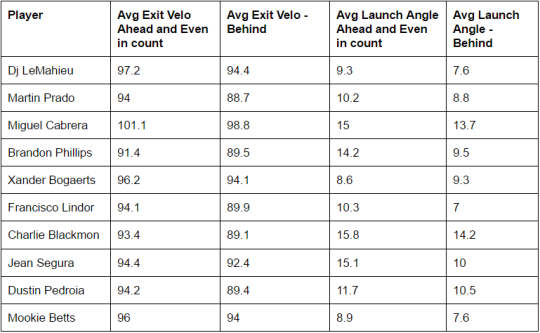 Francisco Lindor and Dustin Pedroia have the largest splits between average exit velocities when behind and not, which maybe suggests more confidence in their path to the ball in certain counts. Meanwhile, Jean Segura and Brandon Phillips appear to be more willing to put the ball in the air when they’re not down in the count. Phillips showing up on this list at all suggests, perhaps, why he’s been able to stick around so long. Even if he hasn’t always hit well when down in the count he does seem to exercise comfort in tight situations he may find himself in the last couple years. Then there’s Miguel Cabrera, who is clearly the best hitter on the list. He’s also the only one who appeared in the top 30 in the majors in walks last year, ranking 21st. That speaks to something in general about these guys — they do get down, and they don’t walk a ton. Being able to get on when behind in the count could be a key to why they hold value. Now, if you’re like me and have streaming options at your fingertips but can lose interest in a game, I’ve also broken down when these guys got on base after losing leverage at the plate. 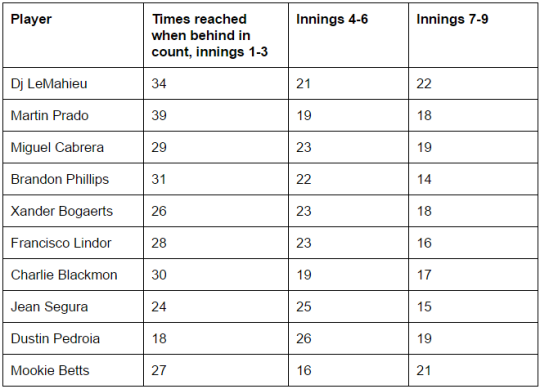 Martin Prado and DJ LeMahieu got on the most when down in the count last year in the first three innings of the game. Dustin Pedroia and Jean Segura were the leaders in the middle innings. It’s interesting that LeMahieu and Betts lead in the late innings and are the only ones who didn’t see a decrease in hits from the middle innings to the end of the game. 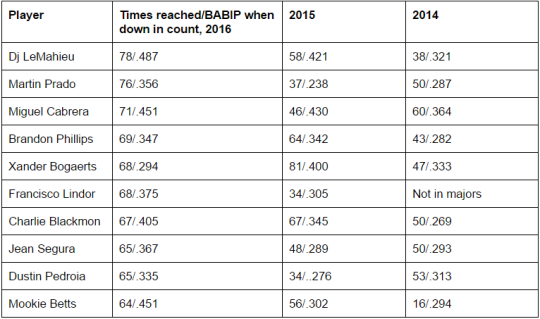 There is plenty of variability here — that’s partially why I included BABIP up top. This is more for fun than predictive concerns. But should these players maintain a similar approach at the plate this season, they could be getting on base when behind in the count roughly 25% or more of the time they’re on base all year. That means any of these guys could be reasons to tune into another game while you’re waiting for your team’s to start.